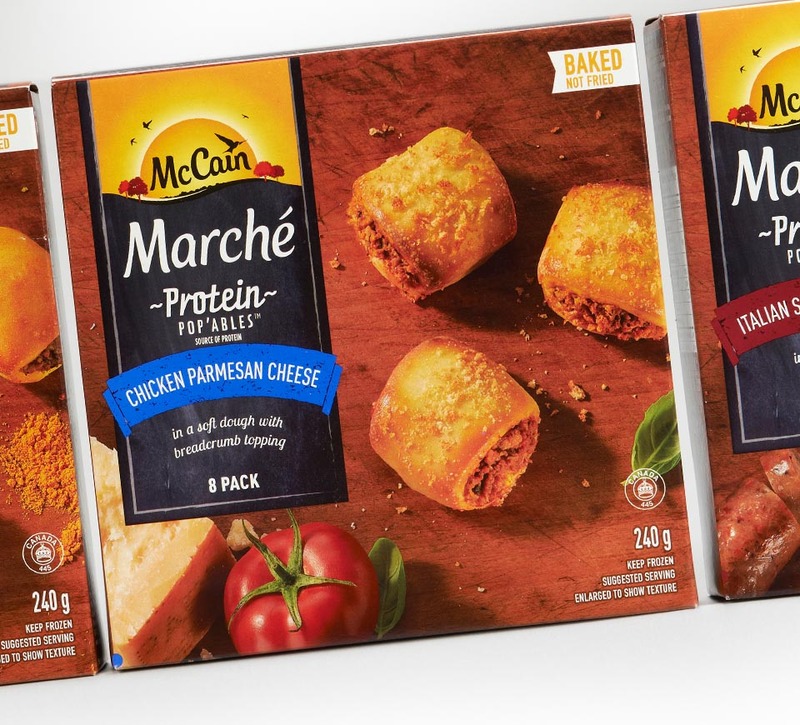 Shikatani Lacroix created packaging designs for a new sub-brand of warm, wholesome snacks for client McCain. 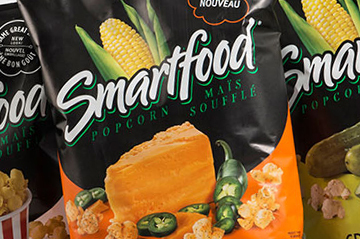 These products were developed to fill a new gap in the snack category, driven by on-the-go lifestyles, for substantial snacks that could be quickly and easily warmed up, but also met a higher standard for wholesomeness. 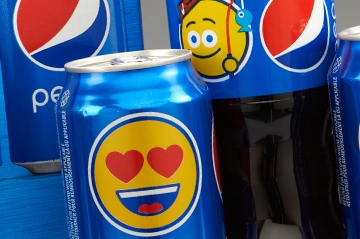 The new products hit store shelves in September 2016. 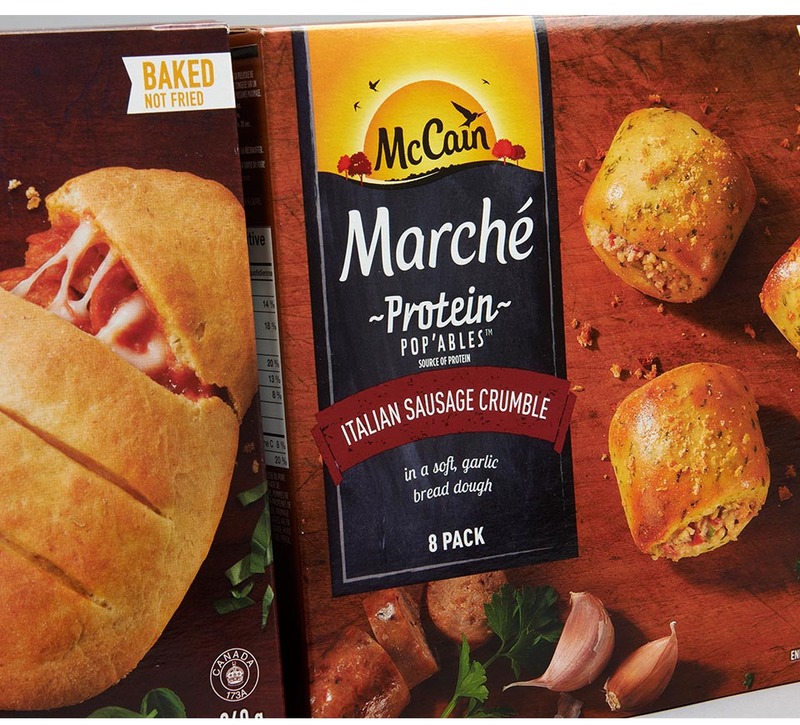 McCain saw an opportunity arising in the snack category: with eating becoming less of a structured, at-the-table activity, and the intensification of on-the-go lifestyles, snacks were beginning to play a new role in people’s daily lives. 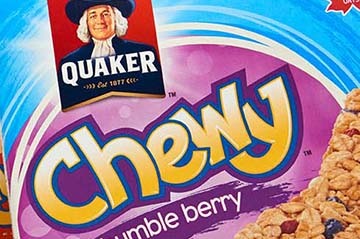 Consumers wanted snacks that would sustain them for longer, and even allow them to skip a meal if needed. 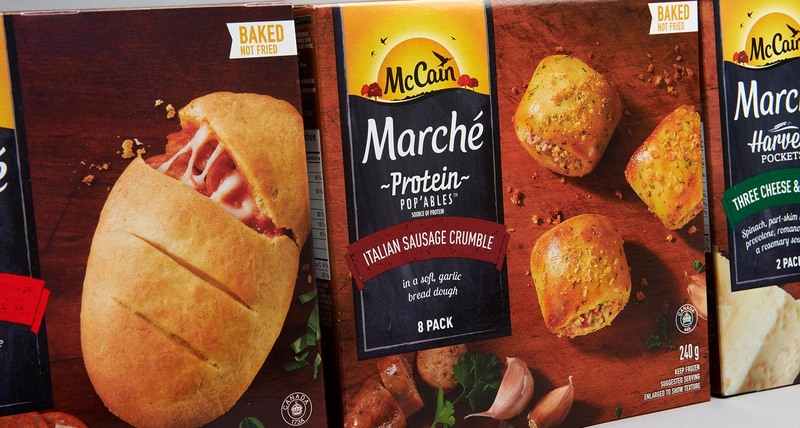 McCain’s research showed that consumers were bored with their current snack options, such as nuts, fruit and yogurt, but also wanted wholesome choices that were not heavily processed. There was very little on the market that met consumers’ desires for a quick, warm snack made with wholesome ingredients that could keep them going from one activity to the next. 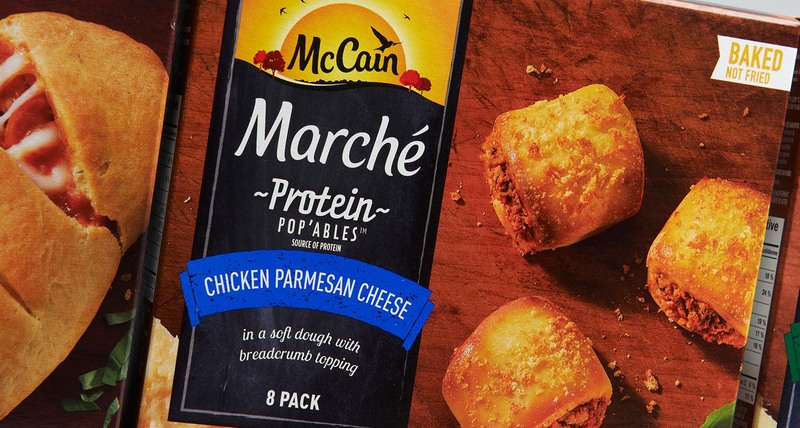 McCain decided to create a new sub-brand of products to fill this gap under the name McCain Marché. 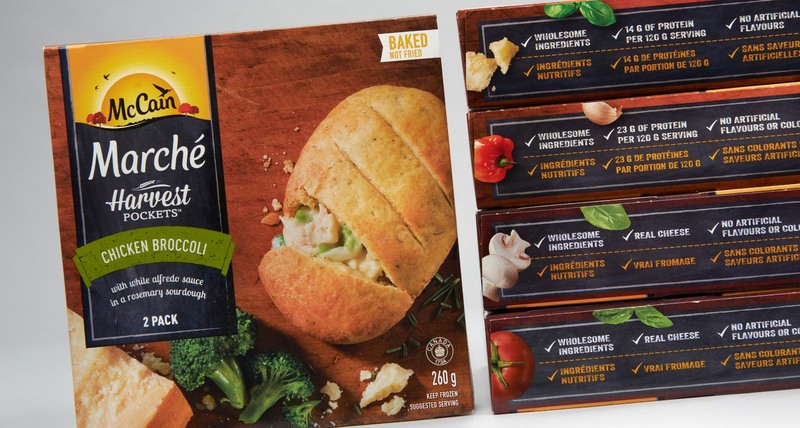 Using wholesome, simple ingredients, they explored a number of options before creating two new product lines: Protein Pop’ables and Harvest Pockets, with a variety of flavor options for each product. 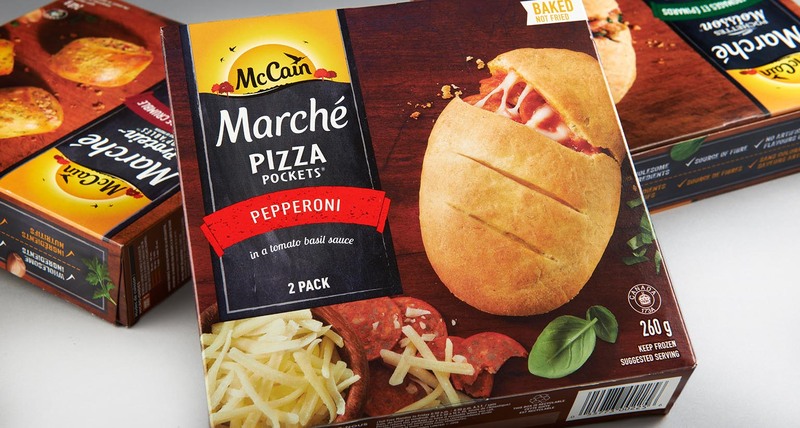 This also created an opportunity to reposition Pizza Pockets and make it more relevant to adult consumers, with a larger size but same great recipe. 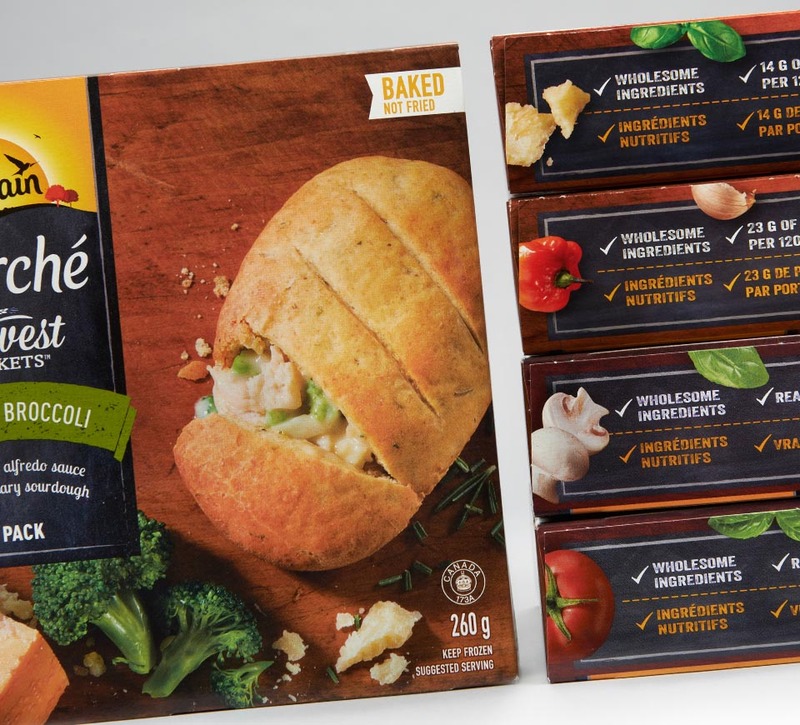 There were a number of significant hurdles to overcome in designing a successful package to bring this new sub-brand to life. 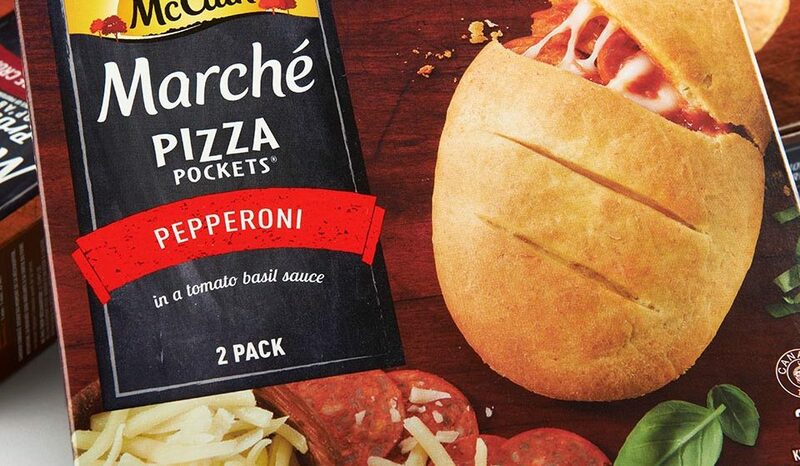 Warm snacks are a relatively new concept, and as with any new product or idea, the package design and new brand needed to leap out at consumers and speak to the core values of the product. 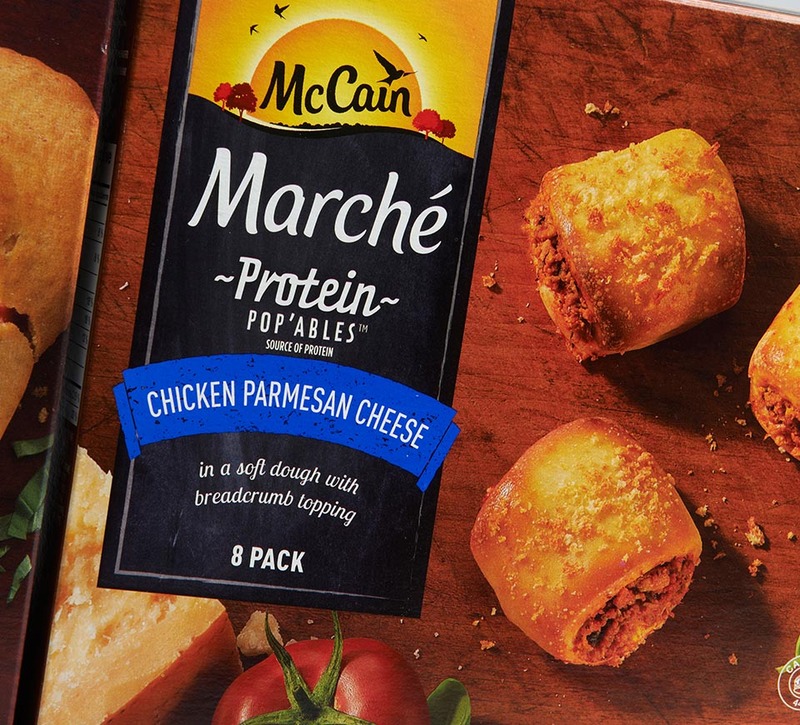 McCain’s current warm snack offering, the after-school classic McCain Pizza Pockets, were viewed as only for kids and filled with processed ingredients like all frozen food. Not only did McCain need to change this perception amongst moms (the previous target), but also with Gen X and Millennials, the new target. All are looking for new, delicious snacks without compromise. 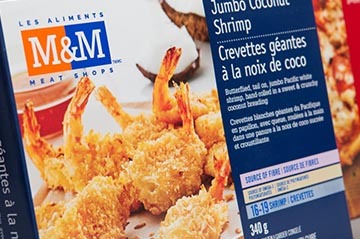 Additionally, consumers do not typically look for snacks in the frozen section, so ensuring the products were not confused with entrees or appetizers was a key concern. 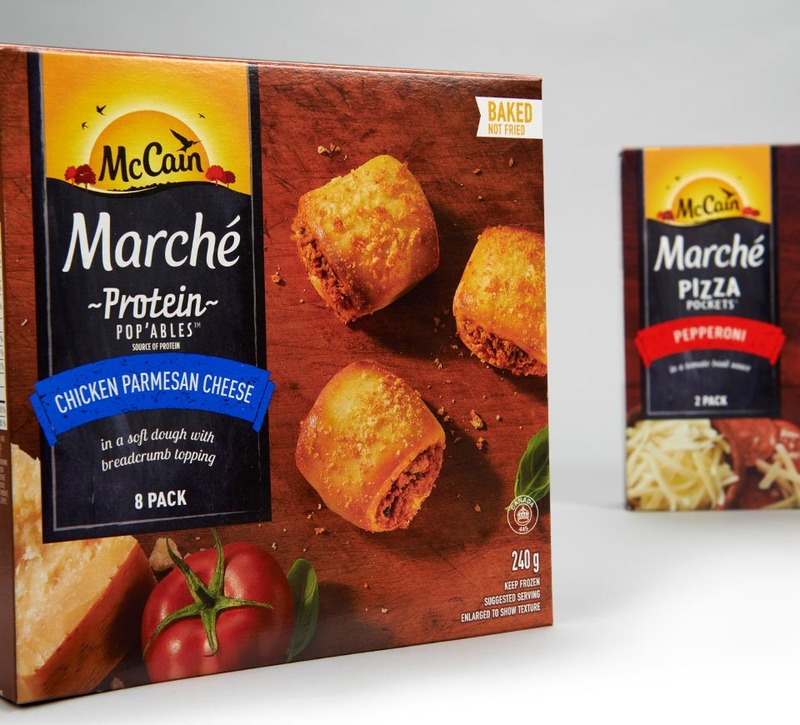 As for any new product, the package design for the McCain Marché sub-brand needed to do many things: in addition to standing out on the shelf, it needed to explain what the new offering is, excite consumers about it and entice them to try something new. 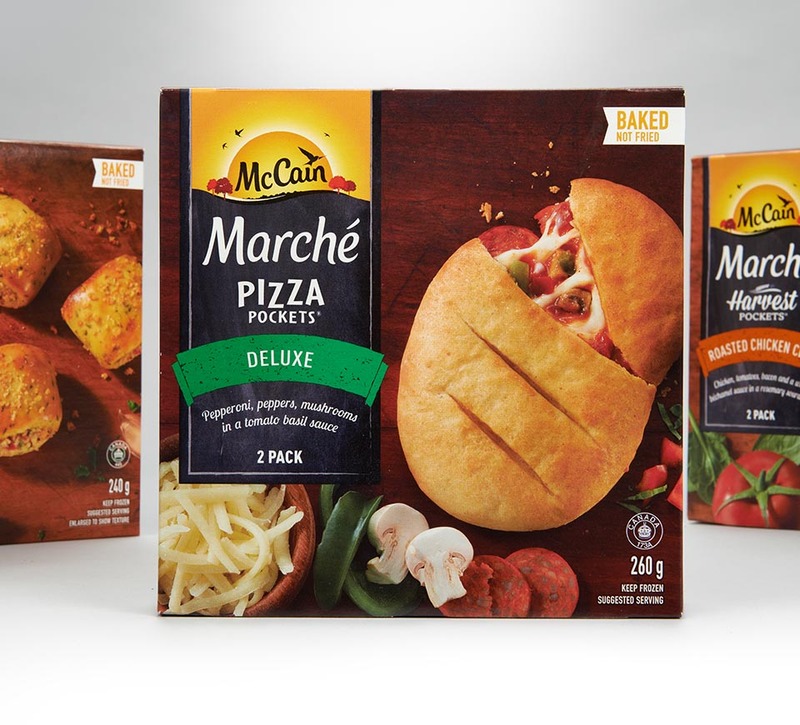 McCain considered a number of name options, and we looked at numerous design ideas, carefully honing in on the key elements that spoke to the qualities McCain really wanted to highlight. Throughout the process, it became clear that a “market” feel was desirable as it communicated wholesome ingredients and simplicity, so our designs focused on that direction. 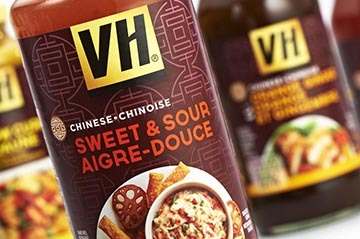 Shikatani Lacroix created warm, appetizing package designs that not only communicate the simple ingredients used in the products, but highlight their deliciousness. The deeper colors stand out in the category, which is full of bright reds and greens, and feel richer, especially when compared to other frozen prepared foods. Images of wood, a blackboard with white chalk, fresh ingredients, and a hero shot of the product, mouth-wateringly warm and steaming, reinforce the sense that the products are delicious and simple, and work against negative perceptions of frozen food. 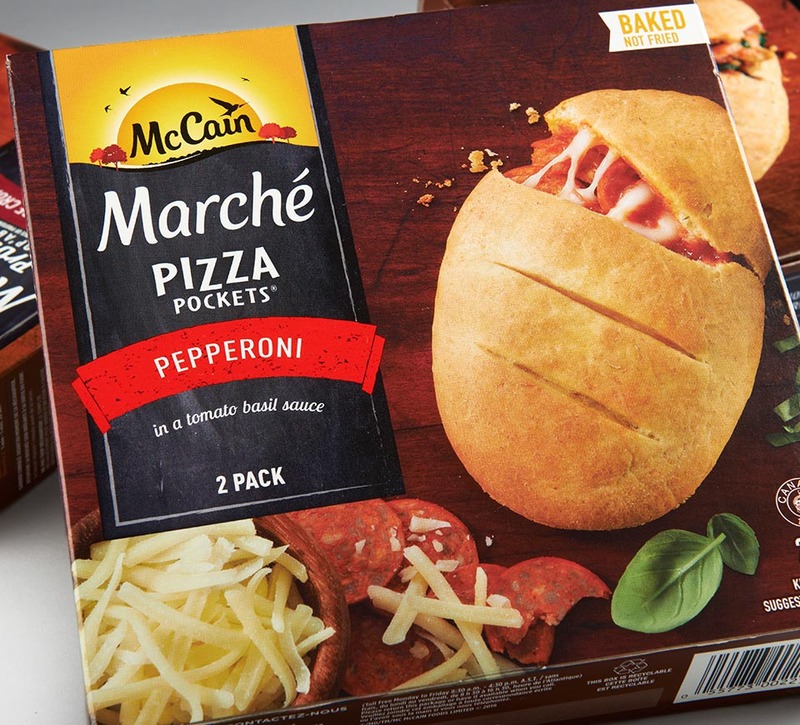 The McCain Marché line of warm, substantial snacks hit grocery shelves in September 2016, including the new, improved Pizza Pockets. Shikatani Lacroix has designed a pack that can easily be adapted for further line extensions and other flavors. McCain reports that it’s still early days, but results have been favorable. 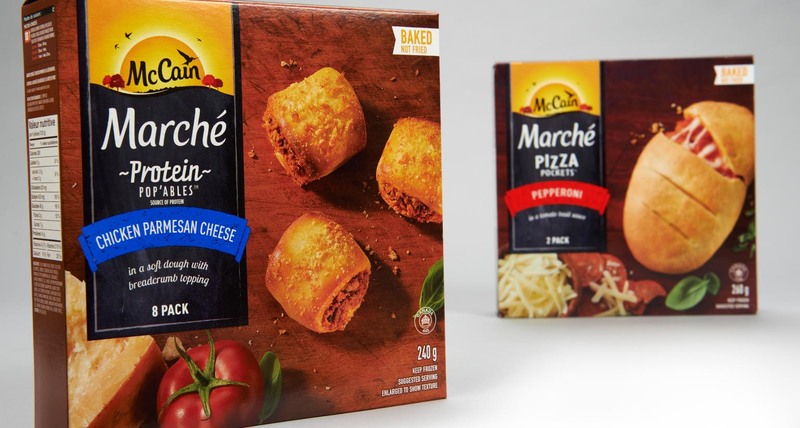 Retailers are very excited about the opportunity to bring new, relevant snacks to the frozen food aisle, as it’s the only category that has yet to capitalize on the change in consumers’ eating behavior, until now. 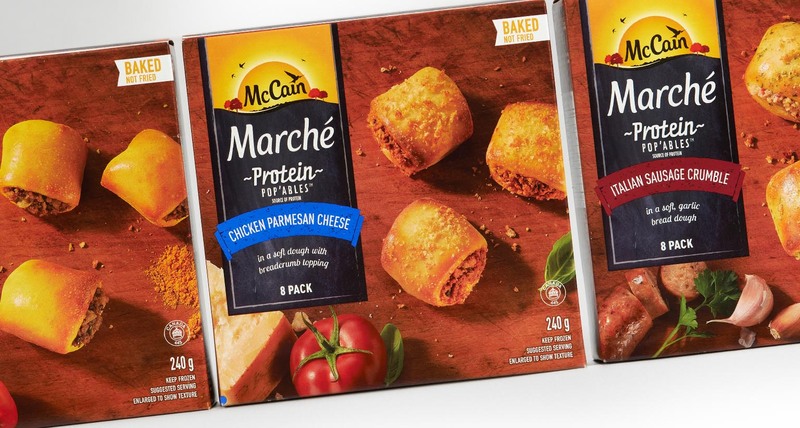 The launch is being supported with a strong marketing campaign, which will continue to drive consumers to store to find the new packaging on shelf. 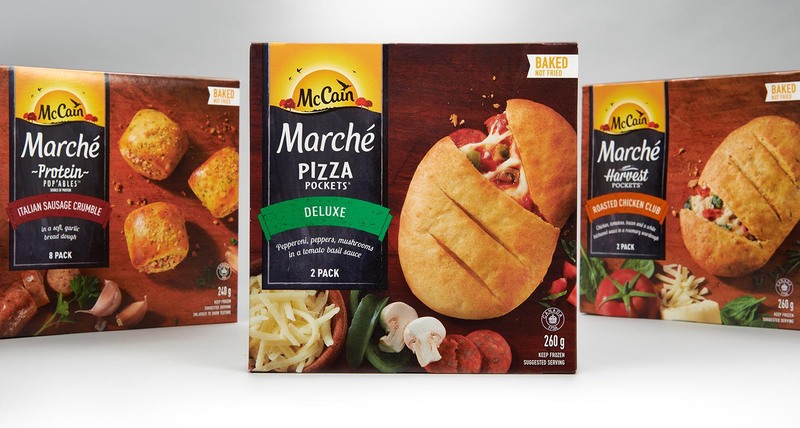 McCain has strategically positioned themselves in between pizza, and dinners and entrees (top categories).